Image; K-10 Rover during testing on Devon Island at the Haughton Mars Project Research Station in July 2007. Credit: Spaceref. Robotic Recon experiment will investigate how robots can improve the productivity and science return of human missions. Lunar samples from the Apollo program have proved to be invaluable in deciphering the geologic evolution of the moon. But Apollo 17 was actually the only Apollo mission to include a geologist, Jack Schmitt, who was also the last of the Apollo astronauts to arrive and set foot on the Moon. Apollo 17 proved to be NASA's last attempt at deciphering the moon's geologic context first hand. During Apollo 17's second EVA, the crew drove from the landing site to the South Massif. Finding very little of geologic interest they then worked their way back to Shorty crater, making stops on the way. At Shorty crater, Jack Schmitt observed orange soil (volcanic glass) that was perhaps the most important find of the mission. Image: Magnified view of lunar sample. Image Credit: NASA. A substantial portion of the lunar surface has not been explored, and a number of geological questions remain unanswered. 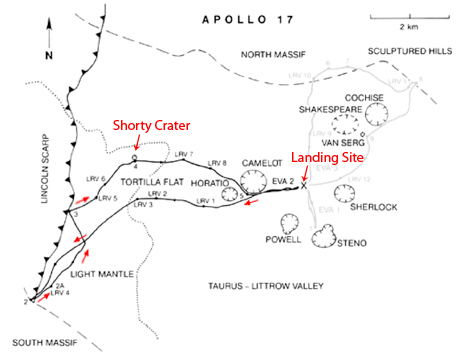 If NASA had been able to conduct recon of Shorty crater prior to the EVA, we could have identified the orange soil ahead of time and used this information to optimize the traverse plan, reducing the time at stops along the way so that the crew could have had much more time to work at Shorty crater. Robotic recon involves using a robot to scout planned sorties (deployments) prior to extra-vehicular activity (EVA). Scouting is an essential phase of field work, particularly for geology. Robot instruments provide data that cannot be collected from orbit. The K10 robot, for example, is equipped with multiple cameras (including a GigaPan, www.gigapan.org) and 3D scanning laser that will provide extremely high-resolution images and measurements. Robotic recon can be done months in advance, or as part of a continuing planning process during human missions. From June 14-27, 2009, NASA will use a robot to scout portions of the Black Point Lava Flow in northern Arizona. The K10 robot will be remotely operated from the NASA Lunar Science Institute located at the NASA Ames Research Center (Moffett Field, California). The data from "robotic recon" will be used to plan field work, which will be subsequently carried out by astronauts driving in the "Lunar Electric Rover." The human return to the Moon in 2020 offers new opportunities to advance the scientific exploration of the lunar surface. But, when the new exploration campaign begins, humans will initially be on the Moon only for short periods of time. Between human missions, however, robots will be available to perform surface operations. A central challenge, therefore, is to understand how robots can improve the productivity and science return of human missions. Robotic recon can improve human exploration of the Moon in three ways: (1) it can increase scientific understanding so that better plans can be made; (2) it can reduce operational risk by evaluating routes and terrain hazards; and (3) it can improve crew productivity by enabling activities to be planned in detail. This field test will help NASA better understand and evaluate these improvements.